Roving Mars is a wonderful — albeit brief — look at the marvels of modern day science that sent two robot photographers to Mars. The story of NASA launching rockets into space in order to send two six-wheeled machines to the surface of Mars might sound like a dry subject matter to some. But here’s the trick: director George Butler, who previously sent IMAX back in time with his investigation of Ernest Shackleton’s Antarctic explorations, ever so smoothly tells the story of this highly ambitious project that leveraged the skills of 4,000 people. It took three years to design, build and test the rovers, but pressure was still looming. As the movie notes, there have been dozens of missions to Mars since the 1960s, but two-thirds of them have failed. Complicating matters for the latest batch of intrepid NASA scientists, their astrophysical window of opportunity to launch is rapidly approaching. Meeting that deadline is far from a certainty; the ever-increasingly complicated machinery pumps up the weight of the rovers. Those hefty contraptions, in turn, wind up making the parachutes intended to safely bring them down to Mars unsuitable for the mission. During tests, they shred under the tremendous weight and wind pressure. Even with its brief 40-minute runtime, Roving Mars manages to capture some of the same wonder and excitement conjured up by Philip Kaufman’s The Right Stuff. Buoyed by a score from Philip Glass, the movie magically transports viewers to Mars via the precise computer-animated recreation of the rovers’ flight paths, landing data, and movement information transmitted back to Earth. Those hard-working robots, dubbed Spirit and Opportunity, get a bit of the anthropomorphic treatment Disney is so famous for, but with a difference. In this case, real-life pocket-protector types grow attached to their creations and begin to pick up on differences in “personality” between the two robots. The presentation is perhaps a bit too wistful, given the enormous amount of resources at stake, but the movie carries with it a unique sense of hope for the future. With all the chaos that technology can cause in simple, everyday life, it’s refreshing to see technology once again stretching for the stars and paving the way to a bold future. There are two extra features here. Both are well worth a look, for those so inclined. One is Mars and Beyond, the complete 53-minute episode of Walt Disney’s Disneyland from 1957. It’s a blast from the past — pre-moon landing and 50 years before Roving Mars — that shows how educational television could be family friendly, even with references to Greek philosophers, and mighty darn informative. Many of the fanciful theories about Mars presented here are proven inaccurate by Roving Mars, but nonetheless this is a classic piece of television for those interested more in the nostalgia factor than the hard-core science. Also on board is Mars: Past, Present & Future. It’s a 25-minute collection of interviews that fleshes out the euphoric success of the mission a bit more. The best part is about the future and further talk of sending people to Mars. It works well as an extension of the feature movie, so those fascinated by Roving Mars should definitely give it a gander. The 40-minute IMAX feature is offered in both widescreen (1.78:1, 16:9-enhanced) and old-fangled full screen (1.33:1). Skip the full screen; the widescreen picture is much more conducive to the stellar material. The 5.1 Dolby Digital Surround track (available in English, French and Spanish) is also well done and a good showcase for the music by Philip Glass. Also available are subtitles in French, Spanish and English for the hearing impaired. 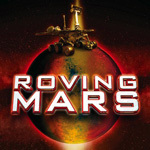 Watch Roving Mars and, if it successfully piques your interest, check out Mars: Past, Present & Future for a bit more. Mars and Beyond is also highly recommended, but mostly for its good, old-fashioned Disneyness. Impatient viewers can skip it and go back to e-mailing on their Blackberries.